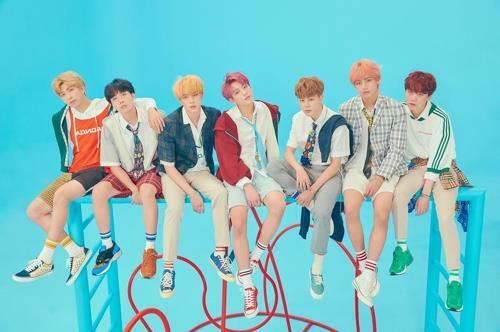 SEOUL, Sept. 5 (Yonhap) — Legend-building K-pop boy band BTS’ new song “Idol” landed in the 11th spot on the Billboard Hot 100, hitting the chart again following their previous single three months earlier. The digital single version of “Idol” featuring American pop icon Nicki Minaj debuted at No. 11 on the Billboard Hot 100, Billboard said Wednesday (Korean time) on its website, one day before uploading the chart. This marks the second time BTS placed on the chart in about three months after their previous song “Fake Love” from the “Love Yourself: Tear” album came in 10th in late May. “BTS’ ‘Idol,’ featuring Nicki Minaj, soars in at No. 11 on the Billboard Hot 100 — dated Sept. 8 — arriving as the second-highest-charting K-pop hit in the chart’s archives,” Billboard noted. “‘Idol’ marks BTS’ fourth total Hot 100 appearance. Before “Fake Love,” “DNA” hit No. 67 last October, while “MIC Drop,” featuring Desiigner, debuted and peaked at No. 28 in December,” it also added. Earlier this week, Billboard also revealed that “Love Yourself: Answer,” fronted by “Idol,” secured BTS their second victory on the Billboard 200 album chart. It set a Billboard record as the first non-English album topping the key album chart since February 2006, when Il Divo’s “Ancora,” a collection of songs in Spanish, Italian and French was No. 1. BTS is also the first act to have scored a double victory on the Billboard 200 in a single year since British boy band One Direction topped the album list twice between December 2013 and December 2014.